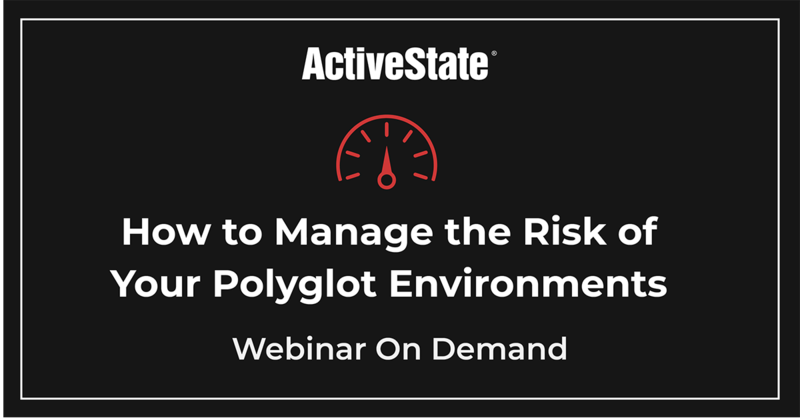 In this webinar, we’ll explore how to navigate the tension between speed and security when it comes to open source languages. Engineering teams want more time to focus on code quality, but product managers want to ship faster. Developers want the best tool for the job, but companies resist adding more technology stacks to their growing tech debt. Retrofitting for security and vulnerabilities after the fact becomes a big blocker for Development and Engineering teams. Enterprises are challenged with resolving new threats and vulnerabilities at the pace at which they crop up. And yet, speed wins over security because faster time-to-market takes a greater priority over fixing vulnerabilities. Minimize DevOps overhead from retrofitting programming languages with new versions, dependencies, security patches, etc. JR oversees ActiveState’s product strategy. He’s spent 26+ years in tech at companies ranging from startups to publicly traded companies and in roles from team lead to Project Manager to VP Development & Services. Pete has more than 15 years of software development experience in open source and games. He earned his undergraduate degree at University of Waterloo, and an MA in Communication from Carleton University in Ottawa. He is passionate about engaging with communities & dedicated to enhancing developers’ experiences. Larry is an industry-recognized thought leader on Lean/Agile, Analytics, and DevSecOps. He currently leads the DevSecOps transformation at Comcast. Previously, Larry led the insights product line at Rally Software which enabled better decisions with data, leveraged big data techniques to conduct groundbreaking research, and offered the first-ever agile performance benchmarking capability. Before Rally, Larry worked at Carnegie Mellon with the Software Engineering Institute (SEI) and CyLab for seven years conducting research on cybersecurity and software engineering.